#1: Have a “brick & mortar” location in Ramsey. #2: Run your business out of your home in Ramsey. #3: Conduct 50% + of your business in Ramsey. The membership fee for the 2019 is $65/year. Read our RCC – Membership intro to learn about benefits of joining. The Chamber may extend Honorary Membership to any not-for-profit organization providing goods or services within the borough. Such Honorary Member organizations will have all member rights except the right to vote. To apply for membership, please fill out our application form. After entering your information, you will have the option of being invoiced or to pay online via Paypal or Credit Card. If you are member looking to renew, please login to your profile and complete your renewal. 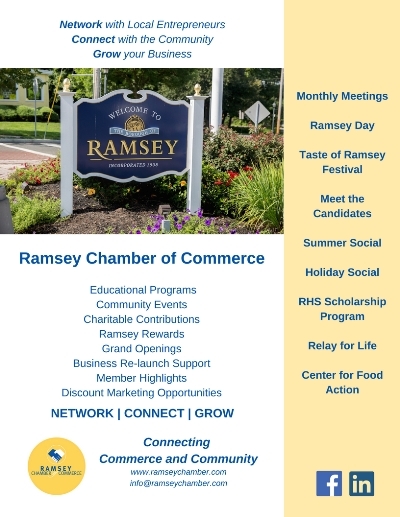 Thank you for your support of the Ramsey Chamber of Commerce!